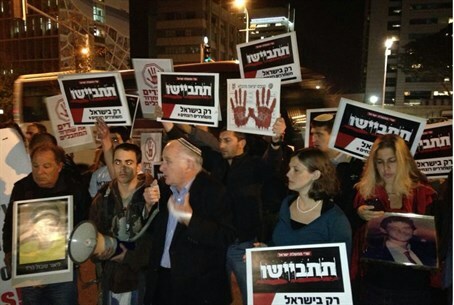 A mass protest of bereaved families demonstrated Thursday night outside a government compound in Tel Aviv, where a ministerial committee meeting was anticipated to approve the looming release of 20 terrorist murderers planned for early next week. Meir Indor, Chairman of the terror victims association Almagor, said the threat posed to Israelis by terrorism increases every time US Secretary of State John Kerry visits. "We should say to John Kerry and to (US President Barack) Obama, don't press Israel. No to double standards, Israelis and Americans have the same rights," argued Indor. He added that just as the US doesn't release terrorist murderers, it shouldn't press Israel to do so. The ministers voting on the release came in for heavy criticism. "On this day we say to governmental ministers that supported the terrorist release, shame on you. Look us in the eyes and tell us why you conducted the release of terrorists up till now...so they will arrive in (PA Chairman) Mahmoud Abbas's open arms? We release and they slaughter us," said protesters. Oren Tamam, the brother of soldier Moshe Tamam (Hy''d) who was kidnapped, murdered and mutilated in 1984 by terrorists who are now set to go free, said at the protest "we came to protest against this awful decision." "We call on Prime Minister (Binyamin) Netanyahu and all the ministers who raised their hands in favor of the vote to free the terrorists to take it back," said Tamam. "Since the two previous batches (of releases) the terror has only risen. An additional release of terrorists will only add to these incidents." Some of the protesters blocked the road saying "Jewish blood is not a gesture." They succeeded in slowing down traffic for several long minutes until police officers were able to clear them. Netanyahu is poised to announce new housing plans next week timed for the terrorist release. Bereaved father and current events analyst Dr. Aryeh Bachrach recently called Netanyahu a "scoundrel," arguing that the Netanyahu uses housing plans to deceive the voting public. Meanwhile the Supreme Court rejected a petition on Thursday, which called for stopping the release until clear criteria are established about the releases.